(left) Liu Yifei and Feng Shaofeng, and (right) Leon Lai in White Vengeance. The Skinny: Entertaining but underwhelming telling of the story of the Hongmen Banquet. Daniel Lee's visuals are fine, and the overall theme and story are good. The acting, storytelling and development are all questionable, however. Featuring the most unintentionally entertaining game of Go ever put to film. White Vengeance has a puzzling English-language title, but beyond that this Daniel Lee-directed historical drama makes complete sense – that is, if you brush up on your Chinese history and walk in with the proper context. Some coffee would help too, because at 138 minutes, White Vengeance is a long haul. The film's Chinese-language title refers to the Hongmen Banquet (a.k.a. The Feast at Hong Gate), a famous event in 206 BC that helped to determine the post-Qin ruler of China. The contestants: the Western Chu and Han Kingdoms, led by their respective generals Xiang Yu (mainland heartthrob Feng Shaofeng) and Liu Bang (Leon Lai). As the story goes, the two were among the most prominent leaders of the forces rebelling against the Qin Dynasty, and though Xiang Yu had the stronger force, it was Liu Bang who occupied Qin capital Xianyang and gained the Qin emperor's surrender. Ergo, the Han are now China's ruling force and Liu Bang gets to call the shots. Naturally, Xiang Yu is pissed and rides to claim his self-appointed place upon China’s throne. Liu Bang is seemingly humble, offering to turn over China’s reins to Xiang Yu – though there are many reasons why that won’t happen. For one, Liu Bang’s allies prefer Liu Bang’s sensible leadership over Xiang Yu’s hot-blooded power-mongering, plus Liu Bang has a trump card: he’s in possession of Xiang Yu’s consort Yuji (Liu Yifei). However, the righteous Liu Bang wouldn’t dream of using her against Xiang Yu. Or would he? Neither side is entirely sure what the other side will do, but both want the other side out of the way. Enter the Hongmen Banquet, where the two sides are supposed to engage in an amicable handover of power between Xiang Yu and Liu Yang. But Xiang Yu may choose to assassinate Liu Bang instead. Similarly, Liu Bang may pre-emptively take action against Xiang Yu. Which side will surprise the other by doing something aggressive, even though both sides expect something surprising, and plan to subvert those surprises with their own surprises? And will anyone ever serve food at this banquet? Maybe there was food served at the Hongmen Banquet, and maybe it’ll be seen in The Last Supper, director Lu Chuan’s forthcoming film on this same historical event. However, there’s no food to be seen in the White Vengeance version of the Hongmen Banquet – that is, except for one unexpected snack that Fan Kuai (Jordan Chan) consumes in order to support Liu Bang and tick off Xiang Yu. Fan Kuai’s gambit amps the tension, but it’s simply another chess move as both sides jockey for position through thinly-disguised double-talk, sly misdirection and just plain insincerity, before the whole banquet collapses and both sides openly resolve to be enemies. Though the event itself is a minefield of mind games and betrayal tropes, Lee only focuses on the titular banquet briefly before ceding to the grander drama of armies massing and people realizing that their friend is now their enemy, but they may respect their friend more now because as their enemy, they see just how damn cool that friend is. Yep, White Vengeance is a “frenemy” movie rife with male bonding and heroic brotherhood iconography. The Warring States period is always ace for film or TV adaptations because this rampant frenemy action is usually awesome. Sadly, the frenemy aspect of Liu Bang and Xiang Yu’s relationship is weak. Feng Shaofeng struts assuredly as the rock star-like Xiang Yu, but Leon Lai is cold and even dopey as the supposedly cunning Liu Bang. 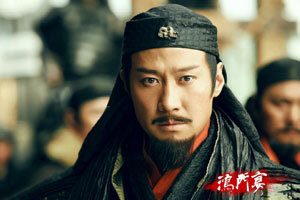 Lai improves as the film progresses, but he ultimately fails to convey the conflict or loss that Liu Bang experiences. Similarly, Xiang Yu and Yuji’s relationship is nigh-uninteresting, though Daniel Lee forces it upon us as some sort of tragic romance. The male characters are very entertaining though; the film features numerous interesting hero types, from the loyal-to-a-fault Fan Kuai (Jordan Chan playing Chicken in Ancient China) to the kickass General Han (a charismatic Andy On) to wise councillor Zhang Liang (Zhang Hanyu in the film’s best performance). A sage super-thinker who may be playing mind games with everyone at once, Zhang Liang has his own frenemy action going on with Xiang Yu’s councillor Fan Zeng (a hammy Anthony Wong), which starts at the Hongmen Banquet over some games of Go before spiralling into some smart “five moves ahead” strategic action with real life consequences. It’s these strategic mind games that make White Vengeance most entertaining because really, that’s where the action in the Hongmen Banquet story is. The problem here is that some audiences may not find such action entertaining, and indeed White Vengeance suffers because much of that drama is based on audience familiarity with the event’s iconic status. This assumption of audience knowledge is not necessarily wrong, as we’re dealing with real historical events that most everyone in China should know. However, the film does not do a good job of introducing its subject to the audience – especially a Western one who are likely tuning in for reasons besides strategic mind games. Action here is mostly montage and predetermined in its outcome, so those expecting finely-choreographed and exciting throwdowns will be put off, and the battles themselves are mostly perfunctory. What works in White Vengeance is its story, which has a strong thematic payoff that’s decently if not superbly developed. There’s added power in this portrayal of the Hongmen Banquet besides the requisite betrayal tropes. That added power? Giving it away would be a spoiler, but the themes are tragic and suitable for anything with William Shakespeare’s name attached. There is a classic idea here that audiences everywhere should appreciate.